Around 2,000 people participated in a traditional Karen wrist tying ceremony in Kawkareik township on August 7. 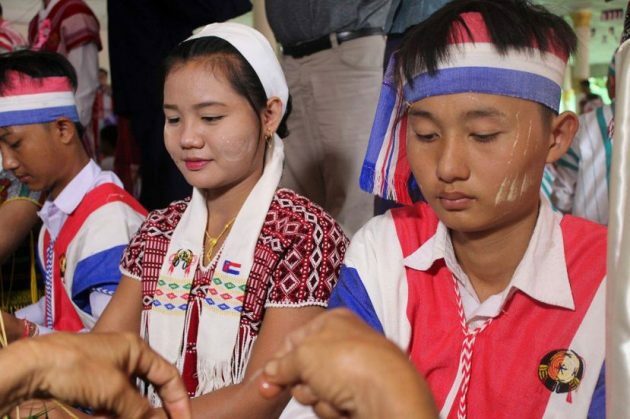 “This white thread tying ceremony [wrist tying ceremony] is as much a part of the Karen national character as our language, literature, customs and culture. We are holding [the ceremony] this year as a way of preserving the tradition. We will continue to hold it in the future,” said Saw Eh Ga Ma Lal Laung Seik, chair of the ceremony preparatory committee. The Kawkareik ceremony involved members of the Karen National Union, government officials, village community elders and local residents from 26 villages. Kayin (Karen) State Deputy Hluttaw Speaker ‎Nang Thuzar Khin also attended. Villages in Kawkareik township have been coming together to hold the annual wrist tying ceremony for more than 50 years. The custom is also increasingly practiced in other areas of Karen State, Mon State, Yangon Region and Ayeyarwaddy Region, according to the ceremony preparatory committee. Thousands of Karen migrant workers held their own wrist tying ceremony at a monastery in the outskirts of Mae Sot on August 6. The Karen wrist tying ceremony is held during the month of Wagaung, or August, every year. The wrist tie is meant to protect children, grandchildren and great-grandchildren from harm and evil spirits. The annual traditional typically involves seven ingredients: a bowl of cold water, white threads, rice balls, triangles of sticky rice, bananas, branches of flowers and pieces of sugar cane. “The wrist tying ceremony has been held even before the Karen people started practicing religion. This ceremony should be preserved as it concerns all Karen people and it does not discriminate between religions,” said Mahn Shwe Hnin, a member of the ceremony preparatory group.